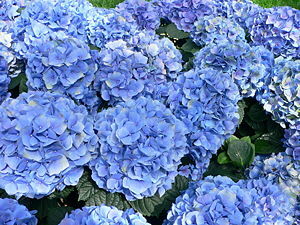 In acidic soils, the blossoms of Hydrangea macrophylla are blue; in alkaline soils, the flowers are pink. The word "acid" comes from the Latin acidus meaning "sour." In chemistry, however, the term acid has a more specific meaning. An acid (often represented by the generic formula HA) is any substance that in solution tastes sour, produces a prickling or burning feeling on contact with the skin, changes the color of indicators (e.g. reddens blue litmus paper), reacts with some metals to liberate hydrogen, reacts with bases to form salt and water, promotes certain chemical reactions (e.g. A chemical reaction accelerated by the addition of an acid; the acid itself not being consumed in the reaction, called acid catalysis), and gives a solution with a pH of less than 7.0. Acids and bases complement each other. When combined, they neutralize each other to form salts. Acids and bases and the reactions between them exemplify the ubiquitousness of complementary pairs in the natural world—plus and minus, male and female (the "yang" and "yin" of oriental philosophy)—whose interactions produce the dynamism and multiform existences populating the universe. Acids are essential for life, and many occur naturally. For example, our stomach produces hydrochloric acid (HCl) to help digestion. Acids are also widely used in industries and are in a large number of foods and beverages. However, many acids are poisonous, and can cause severe burns. Examples of acids include the inorganic substances, also known as mineral acids—compounds composed of hydrogen and a nonmetal element or radical that does not contain carbon atoms.(e.g. sulfuric, hydrochloric, nitric, and phosphoric acids)—and the organic acids which are present in most fruits and other foods (e.g. citric acid in lemons, oranges, and grapefruits; malic acid, in apples; lactic acid, in sour-milk products; and acetic acid, in vinegar). Acids and bases form complementary pairs, so their definitions need to be considered together. There are three common groups of definitons: the Arrhenius, the Brønsted-Lowry and the Lewis definitions, in order of increasing generality. Arrhenius: According to this definition, an acid is a substance that increases the concentration of hydronium ion—a hydrated hydrogen ion, H3O+, also called hydronium ion—(H3O+) when dissolved in water. Bases are substances that increase the concentration of hydroxide ion (OH-). This definition limits acids and bases to substances that can dissolve in water. Many nineteenth century French chemists, including Antoine Lavoisier, incorrectly believed that all acids contained oxygen. Indeed the modern German word for oxygen is, "sauerstoff" (lit. sour substance). English chemists, including Sir Humphry Davy at the same time believed all acids contained hydrogen. The Swedish chemist Svante Arrhenius used this belief to develop the Arrhenius definition of acid. Brønsted-Lowry: According to this definition, an acid is a substance that donates hydrogen ions in solution. Since the hydrogen ion (H+, hydrogen nucleus) is simply a proton, the Brønsted-Lowry acid is also referred to as a proton donor. The acid is said to be dissociated after the proton is donated. The portion of the acid that has lost a proton can now act as a base (or proton acceptor), and it is called the "conjugate base" of the acid. Brønsted and Lowry formulated this definition, which includes water-insoluble substances not included in the Arrhenius definition. Lewis: According to this definition, an acid is an electron-pair acceptor and a base is an electron-pair donor. These are frequently referred to as "Lewis acids" and "Lewis bases," and are electrophiles and nucleophiles, respectively. Lewis acids include substances with no transferable protons (i.e. H+ hydrogen ions), such as iron(III) chloride, and hence the Lewis definition of an acid has wider application than the Brønsted-Lowry definition. The Lewis definition can also be explained with molecular orbital theory. In general, an acid can receive an electron pair in its lowest unoccupied orbital (LUMO) from the highest occupied orbital (HOMO) of a base. That is, the HOMO from the base and the LUMO from the acid combine to a bonding molecular orbital. This definition was developed by Gilbert N. Lewis. The Brønsted-Lowry definition, although not the most general one, is the most widely used definition. The strength of an acid may be understood using this definition by the stability of hydronium and the solvated conjugate base upon dissociation. Increasing stability of the conjugate base will increase the acidity of a compound. This concept of acidity is used frequently for organic acids such as acetic acid. The molecular orbital description, where the unfilled proton orbital overlaps with a lone pair, is connected to the Lewis definition. Solutions of weak acids and salts of their conjugate bases form buffer solutions, that is a solution of a weak acid and its conjugate base that resist change in pH. Acid/base systems are different from redox (oxidation-reduction) reactions in that there is no change in oxidation state. Litmus test: An acid turns blue litmus paper red. The acidity constant (or acid dissociation constant) is the equilibrium constant that indicates the degree to which hydrogen ions dissociate from an acid. Strong acids are those that almost completely dissociate in water. They have large Ka values; hence, the acid dissociation equilibrium lies 100% to the right, which means that there are mostly H3O+ and A- ions in solution with a very minute amount of undissociated HA molecules. Common strong acids are perchloric acid (HClO4), hydrochloric acid (HCl), hydrobromic acid (HBr), hydroiodic acid (HI), nitric acid (HNO3), and sulphuric acid (H2SO4). For example, the Ka value for hydrochloric acid (HCl) is 107. Weak acids are those that partially dissociate in water. They have small Ka values; therefore, only a small percent of protons are donated to water, keeping the acid dissociation equilibrium to the left. The solution mainly contains undissociated HA molecules with very little H3O+ and A- ions. Common weak acids are nitrous acid (HNO2), hydrofluoric acid (HF), and acetic acid (CH3CO2H). For example, the Ka value for acetic acid is 1.8 x 10-5. The term "hydroxide ion" (OH-) is also called hydroxyl ion. The pH of a solution is a measurement of the concentration of hydronium ions. This will depend of the concentration and nature of acids and bases in solution. Neutralization is the basis of titration, where a pH indicator shows an equivalence point when the same number of moles of a base have been added to an acid. Acidification is the process whereby a compound is added to a solution, leading to a drop in the pH of the solution. One example is when the pollution of air—mainly sulfur dioxide and nitrogen oxides—is converted into acidic substances. This "acid rain" is best known for the damage it causes to forests and lakes. It also damages freshwater and coastal ecosystems, soils, and even ancient historical monuments. Sulfur dioxide and the nitrogen oxides are mainly emitted by burning fossil fuels. The 1990s saw these emissions drop substantially, thanks to a combination of European Directives forcing the installation of desulfurisation systems, the move away from coal as a fossil fuel, and major economic restructuring in the new German Lander. Acidification is nevertheless still a major environmental problem in Europe. It is a cross-border issue, requiring coordinated initiatives across countries and sectors. This section brings together the EEA’s reports on the scale of the problem and the effectiveness of the solutions tried to date. ↑ European Environment Agency. Acidification. Retrieved May 17, 2007. Moore, J. W., C. L. Stanitski, and P. C. Jurs,. 2002. Chemistry The Molecular Science. New York: Harcourt College. Curtipot: Acid-Base equilibria diagrams, pH calculation and titration curves simulation and analysis (freeware). This page was last modified on 10 February 2016, at 21:27.